OK, maybe the elevators themselves haven’t lost their mojo, but they have become somewhat of a dead zone. Very few people look up anymore. Eye contact and spontaneous conversation are in danger of becoming extinct. Elevator pitch? Please. Not nearly entertaining enough. Now you need a dance to go with that tune, just to get someone to look up from their tiny, mesmerizing screen. I’m guilty too. One last message before the doors open and I step into that meeting. Just one last send. I could be standing next to the love of my life or one of the most fascinating people I’ll ever meet, if I just looked up. Is the thrill of getting that last message sent just as much of a high as having a great moment with a total stranger? Or a relationship bonding moment with someone we already know? Elevators used to be happening places. Captive audiences. Impromptu moments to connect during a safely finite window of opportunity. A perfectly timed chance to take a conversational risk, complete with a built in escape route (if needed). They offered so much to so many. What would happen if we actually brought Connection back to the elevator? How many people would we have a chance to get to know a little better? What could happen if we shared those few moments bonding over some innocuous topic and put out some positive energy for the day? How much better of conversationalists would we become? As I ponder these and other questions, I can’t help but think of all the unexpected, pleasant moments that have come from chatting or exchanging a glance with someone while coasting up or down to my destination’s floor in an elevator car. I got stuck in one once, during the giant blackout of 2003. It turned out to be an adventure (not to mention a half decent story) and that’s even given the car smelled funny. In Times Square, there’s a hotel that has the most conversation generating operating system I’ve ever encountered. There are no buttons to select a floor inside the elevator. 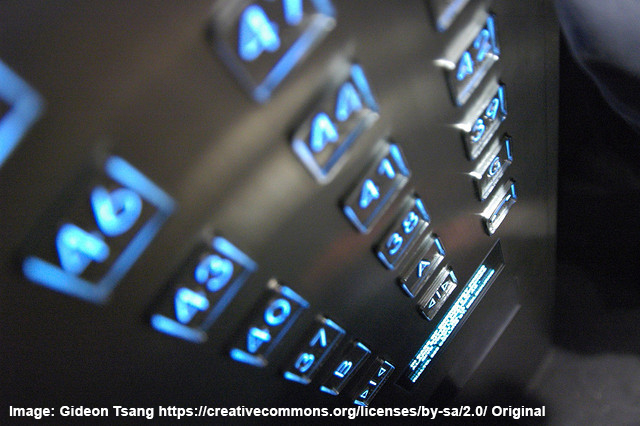 If you want to go anywhere, you must first enter your destination on a keypad in the lobby’s elevator bank and the console will direct you to the specific elevator that has been pre-programmed with your destination. Now that’s a conversation starter. And it is great fun to see passengers light up when the elevator starts to climb. Keep in mind that the elevators are glass and zip up and down through an atrium style lobby—which happens to span over 40 floors. A ride in that wagon is enough time to chat about the best places to eat, where to see the best of NYC and the secret to taking a cab to the airport without getting ripped off. I’ve probably given more recommendations to Broadway shows in that elevator than the hotel’s concierge. And helping somebody to have a better experience visiting my hometown? Well that makes my day. We need to get back to basics. Connecting with people is becoming more of a specialty skill than a normal social grace. It takes conscious effort and practice to learn, a nearly impossible undertaking while we are so plugged into our smartphones. How long would it take for us to get back in shape on the art of connecting with different people? To respond according to their personality and communication style? Wouldn’t this ability and agility help us have a better time in all areas of our life? Think of the potential—and the potential we could inspire in others. If we just looked up, paid attention, said something and listened. It might even be better than Candy Crush.